FIRST ACTS FOR PYRAMID ROCK FESTIVAL 2012 ANNOUNCED! Calling all Pyramid people! It’s gonna be a loud and proud party this New Year’s Eve at Pyramid Rock. Turning nine years old, Pyramid will see in the dawn of a new age in spectacular style! Taking place on the majestic cliff tops of Victoria’s Phillip Island with the ocean providing the dream backdrop. Summer camping under the stars with mates, and a lineup of acts that are set to rock you hard well into 2013! A galaxy of suggestions later and the Pyramid punters have spoken! We are stoked to be on the same page and presenting a killer lineup, and proudly, one with majority Australian artist representation! A lineup that really excites and is set to have the festival’s state-of-the-art concert system humming like it should be. This is a line up harvested from the roots that Pyramid has grown from and signals The New Age! 360, ALL THE COLOURS, ANTI-FLAG, BLOOD RED SHOES, CHILDREN COLLIDE, CLOSURE IN MOSCOW, DANGEROUS!, DCUP, DEAD LETTER CIRCUS, DOCTOR WEREWOLF, DREAM ON DREAMER, FRIENDLY FIRES DJ SET, HANDS LIKE HOUSES, HOUSE VS HURRICANE, ILLY, KARNIVOOL, KINGSWOOD, LUKE MILLION, PHETSTA, STONEFIELD,SLOW MAGIC, UNKNOWN MORTAL ORCHESTRA, URTHBOY, XAVIER RUDD… plus more bands and DJSs to be announced. 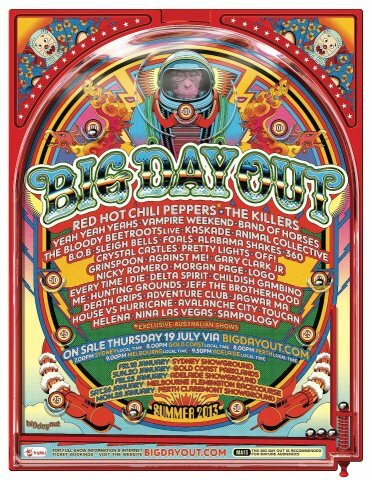 This summer, Big Day Out will play host to the ONLY AUSTRALIAN SHOWS by the RED HOT CHILI PEPPERS. These will be their first Australian festival shows since their record setting headline performances in 2000. Big Day Out is also welcoming back festival heavyweights THE KILLERS who return with a new album under their belts. Big Day Out also welcomes 30 first-timers to the tour in 2013 including YEAH YEAH YEAHS, VAMPIRE WEEKEND, BAND OF HORSES, ANIMAL COLLECTIVE, AGAINST ME!, 360, FOALS, B.o.B, SLEIGH BELLS, JEFF THE BROTHERHOOD, OFF!, JAGWAR MA, DELTA SPIRIT, EVERY TIME I DIE and HOUSE VS HURRICANE. Organisers proud to present for the first time on Australian shores the ALABAMA SHAKES, CHILDISH GAMBINO, LOGO, DEATH GRIPS, ADVENTURE CLUB and GARY CLARK JR.
Australia’s original dance music festival within a festival, The Boiler Room will return to it’s ground breaking roots, bringing you performances from the future so you can dance in the now. Dance-punk headliners THE BLOODY BEETROOTS will perform the world premier of their new live show along with full production sets from KASKADE, CRYSTAL CASTLES, PRETTY LIGHTS, NICKY ROMERO, MORGAN PAGE and SAMPOLOGY with his AV / DJ show. A very limited number of Holographic Souvenir Big Day Out tickets are available from 8am Monday 16 July at select General Pants Co. stores with each ticket going in the draw to win a trip for 2 to our sister festival the world famous Lollapalooza in Chicago! Have your passport ready as each ticket purchase from General Pants Co. allows entry to win a week in Chicago for two including 3 Day tickets to the sold out Lollapalooza August 3-5, 2012. THAT’S IN TWO WEEKS! Your summer starts now! Big Day Out 2013 tickets go on sale Thursday July 19 from 7pm through http://www.bigdayout.com at the all-inclusive price of $165, or $265 for the Like A Boss ticket. No fees, no surprises, no kidding. 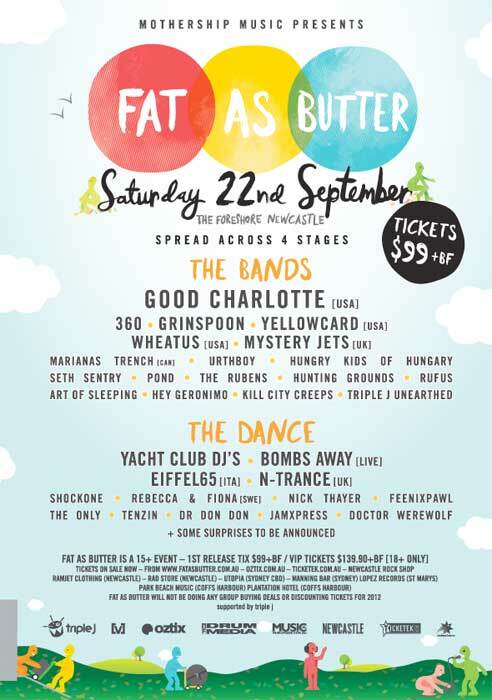 FAT AS BUTTER 2012 LINE UP ANNOUNCED! Fat As Butter Festival cordially invites you to their BIG FAT FESTIVAL, this year featuring something old, something new, something borrowed and something blue. Held on Newcastle’s pristine foreshore, Saturday September 22, organizers are excited to announce this year’s festival is open to 15 + and the first release of GA tickets will be $99.00 + bf. Once again the festival will be held across four stages, with a selection of international and local talent, spanning from dance, hip hop, rock, punk and everything in between. Check out the poster for more details! Joining the Lorne line up today are – 360, Bass Kleph, Dr Don Don, Hook N Sling, Lotek, Mic Newman & Tornado Wallace, Nina Las Vegas, Northeast House Party, Oscar + Martin, Strange Talk and The Death Set. 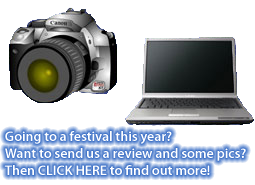 Tickets to the Marion Bay, Tasmania Dec 29 – Jan 1 festival are still available.